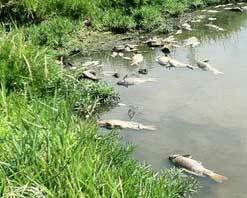 Subdivision and lakefront properties have recently been dealing with a significant die-off of carp, which has apparently been occurring on other area lakes as well. According to the IL Department of Natural Resources - Fisheries Division staff, this naturally occurring condition was most likely caused by the extreme winter; fluctuating water temperatures during carp spawning activities; and the onset of a bacterial infection that negatively impacts on the carp population when this species is in a stressed state. This bacteria is ever-present in lakes and does not impact on other species or humans. Aside from the cleanup, no action is necessary. This event, coupled with the Annual Sportsman’s Club sponsored Carp Derby, over time could benefit Wonder Lake by creating a more balanced fishery.